Sod-seed entrepreneur Daltry (Johnny Knoxville) gets interviewed by an ambitious Ducktown TV newswoman (Laura Cayouette). Irving and director Katrina Holden Bronson chose the 35mm anamorphic format for DALTRY CALHOUN in order to achieve a “fairy tale” feel that only the widescreen “scope” process can capture. June (Sophie Traub) walks the grounds of Daltry’s estate under ominous skies. 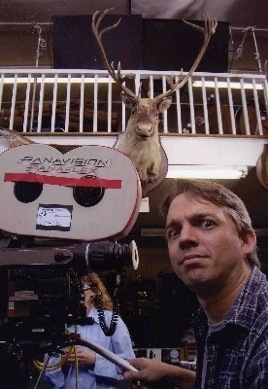 The production shot on-location in Columbia, Tennessee and had to alter its schedule on an almost daily basis, thanks to temperamental weather patterns. Due to the frequent rains, the exterior scenes had to be grabbed whenever the skies cleared, even if it meant moving inside, then outside, then back inside again. May (Elizabeth Banks) waits for Daltry to show up in a small Ducktown diner. Irving will frequently favor a warm color palette for night exteriors, especially in urban or populated areas. Here, he used his favorite flavor of straw and CTO gels to capture the feeling of sodium vapor streetlights. This shot is also an homage to the iconic paintings of Edward Hopper. May (Elizabeth Banks) catches up with Daltry in a Ducktown diner. The distinctly warmer color palette that has dominated the film up until now will start to take on more neutral tones as the fairy tale starts to fray around the edges. Since DALTRY CALHOUN would have a photochemical finish (and not digital color correction), Irving did several tests with Technicolor to determine just the right look for the flashback sequences. In the end, a full bleach-bypass process (applied to the actual camera negative) yielded the results he was looking for. June (Sophie Traub) finds Doyle (David Koechner) singing to the fish. This was an exterior sequence that had to be pushed back several times due to the frequent rains. Finally, with the end of the shooting schedule looming large, the production had to grab the first day without raindrops to shoot the scene, even though it was not the idyllic sunny day Bronson and Irving had been hoping for. It seemed like a “painful compromise” on the day, but it all worked out for the best: the overcast skies gave the scene a wonderfully nostalgic feel. June (Sophie Traub) tries to show Daltry (Johnny Knoxville) the way out of darkness. When June opens the curtains in the beginning of the scene, Irving wanted to capture the feeling of light entering the house for the first time in days. In this frame, June stands illuminated by the sunlight, while Daltry has yet to emerge from his shadowy despair. Ever feel like something’s watching you? On the set of DALTRY CALHOUN, the producers weren’t the only ones keeping their eyes on the crew! Shooting in Doyle’s shed, on the set of DALTRY CALHOUN. Director Katrina Holden Bronson (seated, center) loved hanging out with the camera crew so much, we gave her a special seat on the dolly.